An excellent day of sporting drama in the Premier League - again. And we shall see you all again on Monday night for Arsenal v Newcastle. Jurgen Klopp on Moussa Sissoko's late chance: "In that situation the protection was not there as it should have been. It was brilliant play by Son who played the pass to Harry [Kane] who played to Sissoko. It was brilliantly done by Virg [Virgil van Dijk] but we know Sissoko could have scored." On the title race: "We are top of the table. We cannot be there having no luck. If we are there at the end of the season it will be down to will, desire and attitude. We compete with Man City, tell me two better teams at the moment, and we compete with them. "We needed luck - apologies - but we still take it." Liverpool manager Jurgen Klopp, speaking to Match of the Day: "The first half was good in difficult circumstances for both teams for different reasons, both teams have been much fresher and have been sprinting quicker [this season]. We were the better side. We scored the goal and had other chances. In the second half the only thing they really changed was that they build-up with four instead of five. We struggled a bit. We couldn't really get in touch. We changed system and conceded five minutes later. "I wouldn't say the Spurs goal helped us but it didn't shock us. We were then better in the game. First half it was easy to switch the sides and second half I have no clue why we didn't do it as often as we should. "Then you have to stay in the game and the whole stadium stayed in game. Then we had a lucky punch." There's absolutely no way that goal is being given to Mo Salah. Liverpool striker Mohamed Salah, speaking to Sky Sports, on the late goal: "I think the fans gave it to me! A goal is a goal. "The important thing was to get three points. I haven't scored for couple of games but there are some players who have the same number of goals as me but are having the season of their lives. I'm supposed to be having a bad season! "You do not always have to play good but the important thing is to get the points. The big teams always find a way to get the points and that's what we did today. "Each game now is tough. You just have to keep yourself in the race. Our next game is against Southampton and they are fighting for their lives. "You have to take each game as a challenge. Tottenham played good and they came very close to getting a point. Now we take it game by game." On Liverpool's fans: "The Kop today, it was crazy. They just want to win the Premier League and we are doing everything to make that happen. They help us a lot during the game. Everything changes with the fans - always." Bradley: This has the QPR/Man City feeling on the final day of the season for Liverpool. Tottenham manager Mauricio Pochettino, speaking to Sky Sports: "In the second half we dominated a team like Liverpool. It is not easy to come here and dominate them. After the first half we conceded a goal when there was not too much happening in the game. That was tough for us but in the second half we started playing with a lot of confidence. "It is very tough to lose the game in that way but I feel I am happy because the emotion and feeling we have got today will help us. "It is now a mini-league - seven games and we are in the top four. It is in our hands. "In the circumstances they [the Tottenham players] are more than heroes. We need to keep our trust and confidence and we will fight to be in the next Champions League. It is so important for the club to be in the top four at the end of the season." On Moussa Sissoko's second-half chance: "That shows why Liverpool paid more than £70m for Van Dijk. The legs are heavy and it is difficult to be clear to think and it is not his [Sissoko's] best quality but I am so happy with his performance and commitment to the team." More from Tottenham boss Mauricio Pochettino, speaking to BBC Match of the Day about playing at the new stadium for the first time on Wednesday: "It's so important to manage the energy, a lot of emotion is going to be there. "We need to understand that the players after a defeat can still believe. I am very happy with how they are behaving and their commitment. We are arriving at the last seven games with the possiiblity of a top-four finish and it's in our hands to be there. "They must think they are heroes. but we must be sure how we are going to spend our energy. Now it's about recovery and being clever." Liverpool have still got to play Southampton, who are hitting a bit of form under Ralph Hasenhuttl, and it depends which team Chelsea pick, but I think they have an easier run-in than Man City. Tottenham boss Mauricio Pochettino, speaking to BBC Match of the Day: "We are all disappointed but at the same time we have to be happy with our second half performance. "I was telling the players in the changing room we have seven games and we are in top four and we need to compete. It's a mini league and, playing the way we played today, I think we can achieve the top four." Robbie Savage was full of praise for Virgil van Dijk's defending late on as he forced Moussa Sissoko onto his left side, while Mauricio Pochettino said that he showed "why Liverpool paid more than £70m for him." I thought that he was still letting an international have a free shot on goal and Jurgen Klopp said "he did his job but we still needed Sissoko." How many times now have goalkeepers gifted wins to Liverpool? Absolutely incredible how lucky they are. Liverpool manager Jurgen Klopp, speaking to Sky Sports: "I was relatively calm [after the winning goal] because it was a surprise, that situation. I saw the header and nothing else. I had no clue how the ball went in. "I was not happy we conceded but I thought we needed it a little bit. In the first half we had fantastic chances and scored a wonderful goal. In the second half we looked heavy and couldn't really play. They changed only a little bit. We didn't adapt well. "After Spurs' goal we started playing again more. We had bigger chances. We compete with the best team in the world [Manchester City] and play against one of best in the world in Tottenham - it is a tough task. It is all good. Next up for Spurs of course, the long-awaited first game in their new home. They face Crystal Palace on Wednesday night. Spurs midfielder Christian Eriksen is just the second player to assist 10 or more Premier League goals in four successive seasons, after David Beckham for Man Utd between 1997-98 to 2000-01. Liverpool defender Virgil van Dijk, speaking to BBC Match of the Day: "Tottenham are a very good side with great players who like to have the ball. "We tried to put them under pressure which we did in the first half but in the second half they changed it up a bit. It was a bit difficult for us but in the end we got the three points and that's all that matters." On the title race: "When these moments come we never give up. We are going to try and win every game. It's going to be tough but let's enjoy it and keep going." Van Dijk, who has ice strapped around his right ankle, is asked how he is: "I'm fine." Liverpool extended their unbeaten home league run to 37 games (W27 D10) – the joint-second longest such streak in Premier League history (level with Manchester City), behind only Chelsea’s 86-match run between 2004-2008. 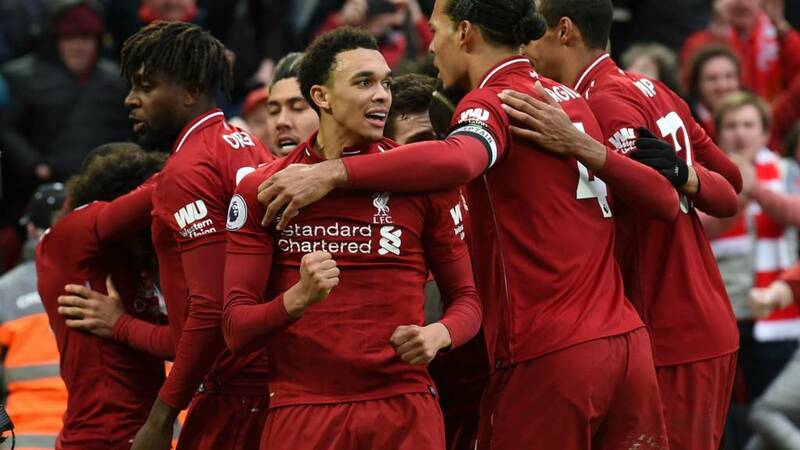 Liverpool defender Trent Alexander-Arnold, speaking to Sky Sports: "We knew what kind of game it was going to be, coming up against a top team like Tottenham. "Both teams wanted to win but I think we wanted it more than them. "Virgil [van Dijk] has shown again why he is the best defender in the world. You need fortune to win these types of games." Tottenham forward Lucas Moura, speaking to Sky Sports: "It is very hard to lose like this. We played very well. At this level of game we cannot make some mistakes and we had chances to win the game. "It is difficult. We played very well. "We cannot lose more points but I am proud of my team-mates." Manchester City play Cardiff on Wednesday night - with Neil Warnock saying earlier on that he will "play the U23s and keep it down to 10 or 11-0." A win for Pep Guardiola's side will put them back on top.